Inspection of Sinarback 43 and Sinarback 54 M at Photokina and GraphExpo. Much to my surprise the Sinar cameras were shown at GraphExpo 2004 trade show. Photokina 2004 was such a crush that even with five days there it was difficult to find a quite moment in the popular SinarBron booth. But at GraphExpo there were not many photographers so it was easier to visit personally with the capable people from Sinar USA. It is very refreshing and honest of Sinar to discuss the Sinarback 43 as a 35mm format. I give high marks to Sinar advertising. Some of their competitors engage in potentially misleading advertising. FLAAR ranks honest advertising as a hallmark of a professional product. After all, if a company has to lie and mislead buyers to sell their product, what defects are they hiding? Sinar makes the Rolls Royce of professional camera equipment. Their booth at Photokina is large and popular every time I visit Cologne (Photokina is held every two years). Not a peep on their website that these backs are not being updated (because Sinar has withdrawn from design and manufacturing of their own backs in the future). No mention that is easy to find on the Sinar website that Jenoptik is supposedly replacing them. No info that the Sinar backs are not as portable and mobile as the competition. 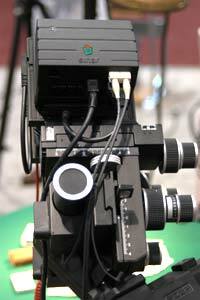 But all Sinar cameras continue: it is only their backs that will not continue. But all of the previous backs of the Sinarback 43M, 43H and Sinarback 54M and 54H series can still be purchased. The "H" models are 1, 4, and 16-shot backs. The M models are 1-shot only. I assume M stands for mobile, though in fact they are not untethered. So their mobility only means you can drag a portable laptop around with them, or pay $7,000+ for a Sinar solution. Sinar is a company dedicated to studio photography; PhaseOne, Leaf, Jenoptik, Imacon-Hasselblad, and now MegaVision, all have true portable systems by now. Since FLAAR is primarily dedicated to digital cameras which can produce enough file size to print at large format sizes, we especially like digital backs with 16 shot capability. Naturally the Sinar 22 megapixel camera back raises our interest. We cover all this and explain what is what in the FLAAR course on digital photography. FLAAR's role in all of this is to evaluate, review, and then decide which cameras are best suited to each of a wide range of applications (product photography, architectural photography, art photography, landscape photography, portrait photography). No one camera can do everything perfectly, so we need to establish which make and model is recommended for a specific range of appropriate applications. During 2003 FLAAR worked at establishing lists of recommended photographic equipment for museums, universities, and conservation institutes, based on a project in the Mediterranean region. Since Dr Hellmuth is a trained archaeologist and art historian, and as there are few photographers in those areas who have experience in sophisticated equipment, and even fewer who have access to the complete range of professional digital camera equipment, and wide format printers too, he and his institute have been selected to set the standards. Hence since 2003 and continuing through 2006, we are in the process of obtaining the appropriate camera equipment for review. For large format digital capture the BetterLight was selected for several reasons: first, they won over all other digital scanning backs three years in a row at PMA. Second, we have had a BetterLight camera for several years so know it inside out. We also have two Cambo Ultima cameras (regular Ultima and the repro version for a Kaiser rePRO stand) provided by Calumet. Thus we know from personal experience that the Cambo Ultima is of top professional quality in terms of construction, detail, and ease of handling. I would consider the Cambo Ultima the Mack Truck of 4x5 cameras, which from me is a high complement. Over the next few months we will continue to review medium format backs. Kodak provided a ProBack Plus for us to work with. Very very impressive results; outstanding color, and the only medium format with true untethered portability. No computer, no cable, no accessories. Just the camera and its battery and you can photograph out on location anywhere in the world. As you can see here, we definitely take this camera out on location. Comparative reviews of all the other medium format digital backs: Imacon , Kodak , Jenoptik , Leaf , MegaVision , and PhaseOne. First posted Dec. 9, 2002. Updated July 3, 2003.